Our brand was created to honour the memory of William Young VC, Great Grandfather to Nigel Salisbury our business partner. the 11th hour on November the 11th we will remember the fallen who fought for our freedom. 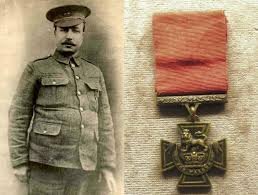 We are proud that William Young was one of the fallen who through his selfless act of courage was awarded the Victoria Cross. When Mary Young asked her husband William if he had not thought it silly, considering he had nine children, to risk his life saving a wounded sergeant, he could not speak his answer. With his jaws shattered and bound with bandages, he wrote: "I would do it again." He later told an interviewer that his actions amounted to "really only about half an hour's work and I don't want a lot said about it." He didn't get a choice in the matter, when his home town turned out to celebrate a hero who waded through mud with an officer on his back. As dawn broke on the morning of the 22nd December, Young looked out over no-mans land and saw a wounded NCO, a Sergeant Allan lying wounded in front of the wire. Allan had apparently only made it back that far from a patrol the night before. On his own initiative, young went through the wire dodging heavy enemy fire and went to Allan's aid. Allan ordered Young back to the line without him, but Young ignored the order. As he was pulling Allan to safety, he was hit twice , one bullet shattered his jaw and the other lodging in his chest. Despite the wounds, Young later joined by Private Green managed to get Allan to safety. On his own, he walked over a mile back to the dressing station at Foncquevillers to have his wounds tended to. William Young spent the next four months in hospital and was well enough to attend a civic reception in his honour in Preston in April 1916. He went into Cambridge Hospital, Aldershot, for a final operation in August, 1916, but he never recovered consciousness; the anaesthetic had caused his heart to fail. He was 40 years old. Young's medals were presented to his old regiment by his son in 1985 and are now on display at the Duke of Lancaster's Regiment Museum, Preston.